Because I’m not a fan of clutter, every Christmas I work hard to find gifts for our kids that they will enjoy throughout the year. Some challenge their minds, some keep them warm, and some are just plain fun. We teach our kids the true meaning of Christmas: that it is about Christ and his gift of salvation to people, so not every “gift” has to be a toy. I think the best gifts are time spent together making memories with our children. And these are gifts that they (and you) will treasure for many years to come. 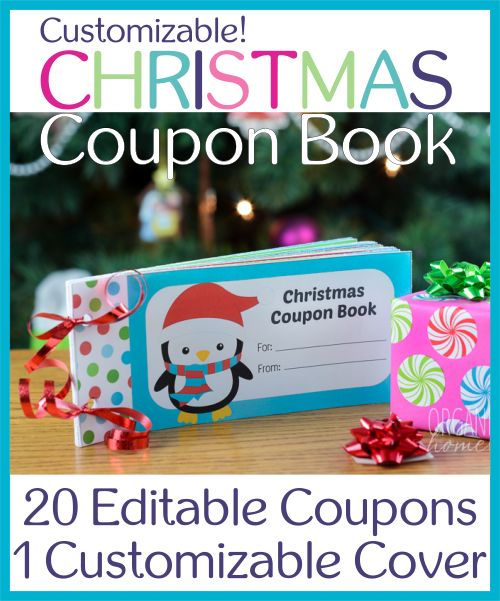 That’s why I created this printable Christmas coupon book, and I’m giving it to you as a free printable download, too! It is filled with ideas for spending time together. I am putting one in each of my kids’ stockings this year and I can’t wait to see their faces. I know we will all enjoy them! There are 17 coupons and one cover. 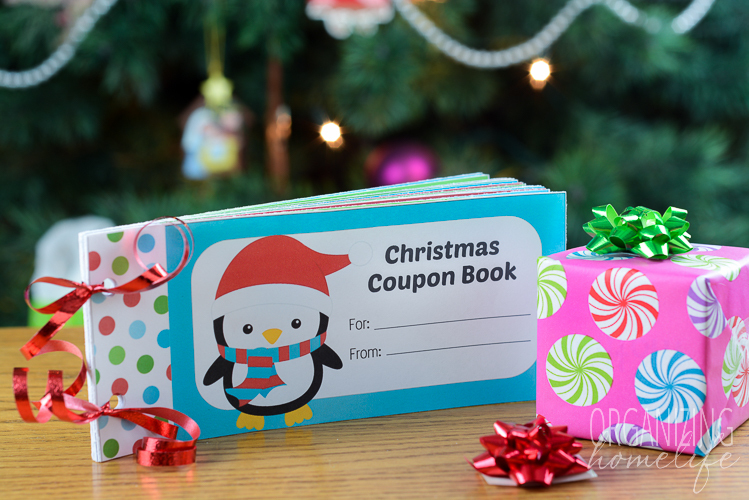 Feel free to print the coupons that apply to your child’s interests and build a coupon book that you will both enjoy. Would you like to print these coupons with YOUR OWN ideas? I have a fully editable/customizable version in my Printables Shop HERE. 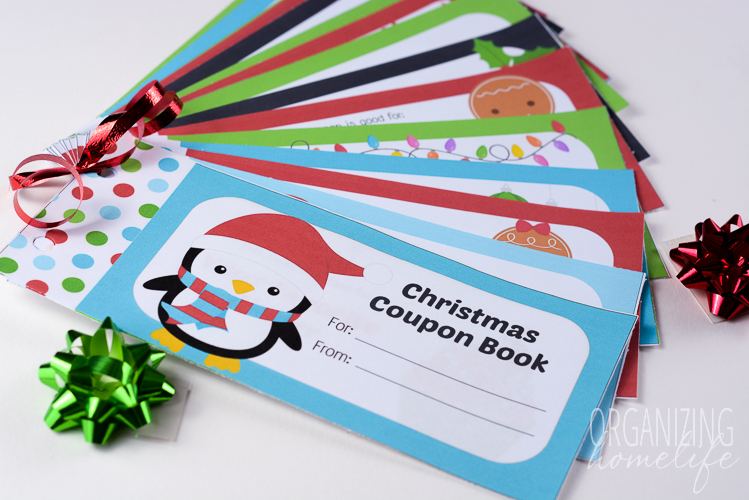 There are 20 editable coupons and 1 cover with editable areas for giver and receiver. Copyright: These printables are copyright © 2014 OrganizingHomelife.com. Printables are for personal use only. Please do not distribute in any format for free or for profit. Please do not link directly to the downloadable pages, but feel free to link to this post. Thank you! 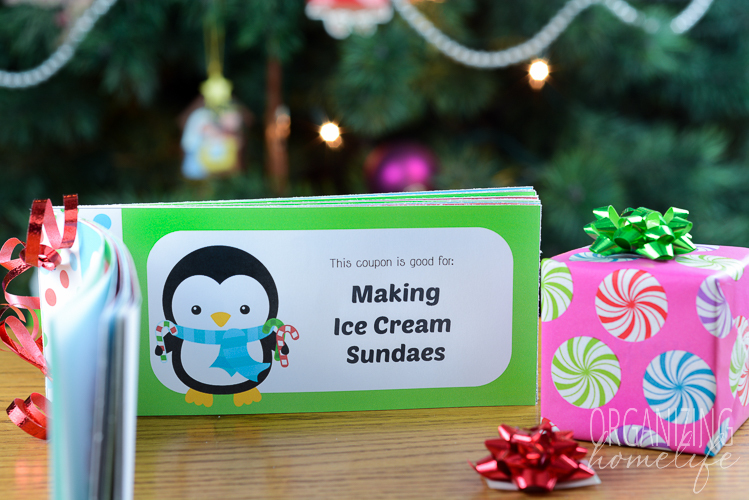 What a great idea, do you allow your children to choose when to use each coupon? I love it! These are so cute and thoughtful. I really try to find gifts that are clutter-free (especially for stockings!) and these are perfect. Thanks Ginny! Just printed these, stapled together and stuffed in the stockings while little boy slept in front of fireplace…can’t wait to see what they pick when! I appreciate your blog and all your advice! Hi Ginny, it’s really nice. I wish I found this post sooner. I love your blog. Hopefully, I will learn more experiences from you. Thanks. I gave these to my kids for Christmas this year, because we planned on a ‘no-toys’ Christmas this year (they get plenty from other relatives). We’ve already used 3 of the coupons, but instead of just turning it in and having it be used up, we’re making them unlimited use coupons, and on the back of each coupon, I’m writing the date and place/activity we did (e.g. Go out of Ice Cream – place and what ice cream they ordered). At the end of the year, I hope it’ll be a great memory keepsake for them of all the fun things we did this year! Our Elf on the Shelf gave those to our kids this Christmas. They love it ! We speak French, but it helps them with their English, which is good. The graphics look fabulous ! I printed them at Staples on cardboard and I used the perforated blade on my paper trimmer to make it easy for them to remove one of the coupons. The end product was very neat. Thank you very much ! I can’t wait to do the activities with my Daughters. Nice tips and thanks for share.